This is a complete guide to food, decorations and gifts for the holiday season. 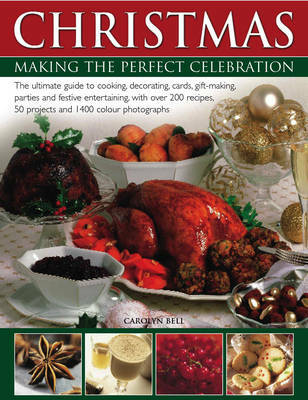 It contains over 200 recipes for festive dinners, party foods, buffet dishes, vegetarian meals, stuffings, sauces and preserves, desserts, cakes, treats and edible gifts, drinks and cocktails. Over 50 projects show you how to decorate your home and arrange a perfect table setting, how to dress your Christmas tree with homemade ornaments, and how to make your own inspired cards and gift-wraps. It includes a week-by-week countdown to help you plan and organize your Christmas shopping and cooking, plus a timetable for preparing food on Christmas Day and suggested holiday menus. The book begins with a countdown to Christmas, with helpful advice on what to buy when, and which preparations should be done first. Next, there are over 200 festive recipes for every yuletide holiday occasion, from main courses and snacks to buffet and party foods, including useful techniques such as how to stuff and roast a turkey, how to test finished cakes, and how to make apricot glaze, almond paste and royal icing. The second part of the book is full of creative craft ideas for Christmas, with projects showing you how to decorate your home with wreaths, garlands, candles and festive table settings, as well as chapters on decorating the Christmas tree and making your own Christmas cards and gift wraps. The whole family can be involved in making gifts such as gingerbread tree decorations, painted candles or Christmas crackers, and there is also a chapter especially for kids with ideas for sparkly sequinned ornaments, glittery gift boxes and of course, stockings to hang up on Christmas Eve.